Egypt Through Other Eyes: The Popularization of Ancient Egypt, presenting more than thirty books from the Museum’s Libraries, documents Western fascination with ancient Egypt in the nineteenth and early twentieth centuries. Showcasing many works never before on public view, the exhibition includes rare material from the Museum’s Wilbour Library of Egyptology, one of the world’s most comprehensive Egyptological research collections. During the nineteenth century, publications on Egypt multiplied as advances in printing technology allowed for the production of larger and cheaper editions of travel literature and history books, as well as newspapers and periodicals. Scholarly publications had an increasing impact on popular culture in Europe and America, especially on architecture, fashion, and literature. The exhibition covers the generation of explorers and scholars who were inspired by Description de l’Égypte, published from 1809 to 1827. The images on view demonstrate the allure that Egypt has long held for a Western audience. Included is an illustrated plate from a rare book by Giovanni Belzoni, one of the first Europeans to excavate Egyptian temples and tombs. Other works include a catalogue and poster for the first major North American exhibition of Egyptian antiquities of the Abbott collection, now part of the Brooklyn Museum collection. Also on view are chromolithographs from books by Émile Presse D’Avennes, whose work provided the earliest reliable images of Egyptian architecture, and a book by Charles Dana Gibson, depicting the Temple of the goddess Mut, where the Brooklyn Museum and Johns Hopkins University currently maintain an excavation site. Several of the items on view originally belonged to Charles Edwin Wilbour (1833–1896), the American Egyptologist for whom the Wilbour Library of Egyptology is named. 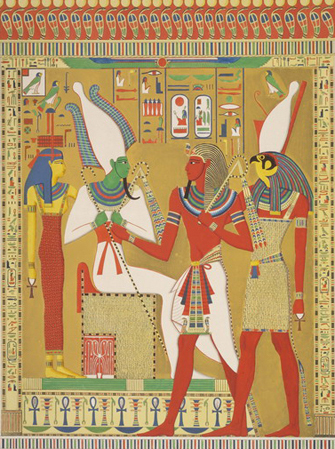 Wilbour, who also collected many of the objects in the Museum’s adjacent galleries of Egyptian art, made a significant contribution to the study of ancient Egypt in America. Walt Whitman wrote about many of the Egyptian objects in the gallery. For a discussion of Walt Whitman’s writings see Walt Whitman and the Arts in Brooklyn. A review of this exhibition was published in the online version of Archaeology magazine. The exhibition was organized by Deirdre E. Lawrence, Principal Librarian/Coordinator of Research Services, and Mary Gow, Assistant Librarian, in collaboration with the curators of Egyptian, Classical, and Ancient Middle Eastern Art.